Draft: 2011, Milwaukee Brewers, 7th rd. Graduated from Neshoba Central (MS) High School…Attended the University of Mississippi…Pitched for the Brewster Whitecaps in the Cape Cod League in 2009. Spent the majority of the season with Triple-A Colorado Springs...Made one MLB appearance with Milwaukee on April 9 vs. CHI. Enjoyed four MLB stints with the Brewers...Appeared in 42 games in his second season with Triple-A Colorado Springs. Had four stints with the Brewers as he made his Major League debut…His stints came from 5/26-6/9, 7/3-7/6, 7/23-7/27 and 8/14-end…Went 1-0 with a 4.01 ERA in 20 relief appearances…Made his Major League debut on 5/26 vs. San Francisco (0.2ip)…Notched his first career strikeout on 5/29 vs. Arizona (Chris Owings)…Earned his first career win on 9/27 at St. Louis went 0-4 with a 2.68 ERA and 4 saves in 38 relief appearances at Triple-A Colorado Springs. Selected by Milwaukee in the seventh round of the First-Year Player Draft.....signed by Joe Mason and Tim McIlvaine. Selected by Cleveland in the 31st round of the First-Year Player Draft.....did not sign. December 20, 2018 RHP David Goforth assigned to Tigres del Licey. December 8, 2018 Tomateros de Culiacan placed RHP David Goforth on the reserve list. November 27, 2018 Tomateros de Culiacan activated RHP David Goforth. November 11, 2018 Tomateros de Culiacan placed RHP David Goforth on the reserve list. November 2, 2018 RHP David Goforth elected free agency. July 31, 2018 David Goforth roster status changed by Syracuse Chiefs. July 21, 2018 Syracuse Chiefs placed RHP David Goforth on the 7-day disabled list. February 13, 2018 RHP David Goforth assigned to Syracuse Chiefs. December 19, 2017 Tomateros de Culiacan activated RHP David Goforth. December 19, 2017 Tomateros de Culiacan placed RHP David Goforth on the reserve list. 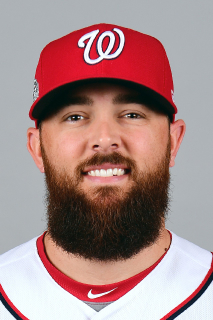 December 10, 2017 Washington Nationals signed free agent RHP David Goforth to a minor league contract and invited him to spring training. October 2, 2017 RHP David Goforth elected free agency. May 11, 2017 Colorado Springs Sky Sox activated RHP David Goforth from the 7-day disabled list. May 4, 2017 Colorado Springs Sky Sox placed RHP David Goforth on the 7-day disabled list retroactive to May 3, 2017. April 17, 2017 Milwaukee Brewers sent RHP David Goforth outright to Colorado Springs Sky Sox. April 14, 2017 Milwaukee Brewers designated RHP David Goforth for assignment. April 9, 2017 Milwaukee Brewers selected the contract of RHP David Goforth from Colorado Springs Sky Sox. January 29, 2017 Milwaukee Brewers invited non-roster RHP David Goforth to spring training. January 1, 2017 RHP David Goforth assigned to Tomateros de Culiacan. January 1, 2017 Tomateros de Culiacan placed RHP David Goforth on the reserve list. December 2, 2016 Milwaukee Brewers sent RHP David Goforth outright to Colorado Springs Sky Sox. November 23, 2016 Milwaukee Brewers designated RHP David Goforth for assignment. November 6, 2016 RHP David Goforth assigned to Cardenales de Lara. October 3, 2016 Milwaukee Brewers recalled RHP David Goforth from Colorado Springs Sky Sox. August 8, 2016 Milwaukee Brewers optioned RHP David Goforth to Colorado Springs Sky Sox. August 1, 2016 Milwaukee Brewers recalled David Goforth from Colorado Springs Sky Sox. June 1, 2016 Milwaukee Brewers optioned RHP David Goforth to Colorado Springs Sky Sox. May 26, 2016 Milwaukee Brewers recalled David Goforth from Colorado Springs Sky Sox. May 9, 2016 Milwaukee Brewers optioned RHP David Goforth to Colorado Springs Sky Sox. April 29, 2016 Milwaukee Brewers recalled David Goforth from Colorado Springs Sky Sox. March 27, 2016 Milwaukee Brewers optioned RHP David Goforth to Colorado Springs Sky Sox. August 14, 2015 Milwaukee Brewers recalled David Goforth from Colorado Springs Sky Sox. July 28, 2015 Milwaukee Brewers optioned RHP David Goforth to Colorado Springs Sky Sox. July 23, 2015 Milwaukee Brewers recalled David Goforth from Colorado Springs Sky Sox. July 7, 2015 Milwaukee Brewers optioned RHP David Goforth to Colorado Springs Sky Sox. July 3, 2015 Milwaukee Brewers recalled David Goforth from Colorado Springs Sky Sox. June 11, 2015 Milwaukee Brewers optioned RHP David Goforth to Colorado Springs Sky Sox. May 26, 2015 Milwaukee Brewers recalled David Goforth from Colorado Springs Sky Sox. March 23, 2015 Milwaukee Brewers optioned RHP David Goforth to Colorado Springs Sky Sox. November 20, 2014 Milwaukee Brewers selected the contract of David Goforth from Huntsville Stars. January 22, 2014 Milwaukee Brewers invited non-roster RHP David Goforth to spring training. June 21, 2013 David Goforth assigned to Huntsville Stars from Brevard County Manatees. March 30, 2013 David Goforth assigned to Brevard County Manatees from Wisconsin Timber Rattlers. April 2, 2012 David Goforth assigned to Wisconsin Timber Rattlers from Helena Brewers. June 23, 2011 David Goforth assigned to Helena Brewers from Milwaukee Brewers. June 22, 2011 Milwaukee Brewers signed RHP David Goforth.